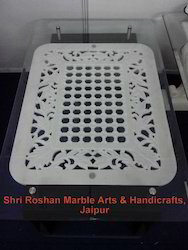 Leading Manufacturer of carved stone table, stone table, marble bed, stone center table, marble table and carved marble dining table from Jaipur. This class of Carved Stone Table indicates the richness of Indian Artistry. This hand carved table with a glass on the top gives your drawing room a luxury and rich look. This Carved Stone Table is just superficially attractive, stylish & a very unique combination of Stone & Glass. 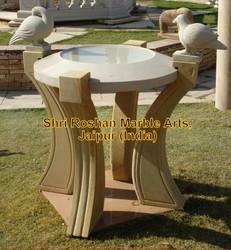 Our team offers some superb designs in Stone Table, made purely by hands. Intrinsic carving done on the table make it a Luxory product. 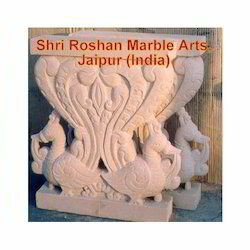 We are one of the leading manufacturers & exporters of some lavishing stone products made of both marble or sandstone. Packaging Details: Packed in 2 different Wooden Crates with foam. 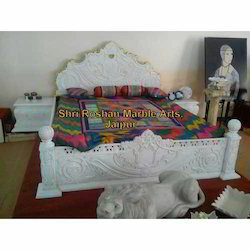 Marble Bed offered are exceedingly demanded for its beautiful designs as well as vibrant color combinations and immaculate finish which makes these highly demanded in the market. Made available in different sizes, these beds are 100% handmade and support creating exceptionally elegant appearance. Some of its features include beautiful, innovative designs; developed from single piece marble stones; featuring nice finishing work that provides for a classy finished looks. We are the renowned manufacturer, exporter, wholesaler, trader, retailer and supplier of the best quality array of Stone Center Table that is fitted with dual glasses one up and one down the jali again adds to its beauty. This center table is crafted by utilizing utmost quality stone by our experienced craftsmen. Offered center table is comes in different designs, sizes and other customized options so as to meet the demand of customers. We are involved in manufacturing, exporting, wholesaling, retailing, trading and supplying the splendid quality Marble Table. 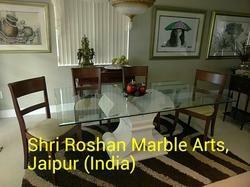 This marble table is appreciated in the market for its beautiful designs and appearance. 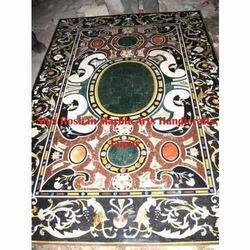 Our marble table is provided in numerous customized designs options as per the choice of customers. Also, this marble table is made by using best quality stone & advance shaping & cutting tools in accordance with the market trends. 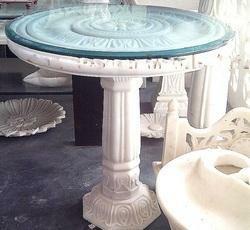 Marble items have always been a royal product, though is this Carved Marble Dining Table. We provide some modern and interesting designs of Carved Marble Dining Tables and are one of the leading manufacturers and exporters of all type of Marble & Stone Interior products. Mentioned prices are approximate only and will change with Quality of stone used, Dimensions, designs and depth of Mentioned prices are approximate only and will change with Quality of stone used, Dimensions, designs and depth of carving. Prices mentioned in the website could be old and hence can vary at actual. carving. Since our inception, we have been providing our customers with some luxury products like this Stone Tea Table. When kept in you room or you garden, this Stone Tea Table will surely become the centrepiece of art. Looking for Stone Tables ?